Advanced magnetic resonance imaging (MRI) technology has become an important piece of healthcare that millions of patients experience daily. Innovere, a medical device company based in Markham, Ontario, is on a mission to improve the patient experience associated with MRI’s. One major limitation they had to face was a lack of in-house medical device expertise that was hindering their ability to establish a compliant QMS that would enable the team to scale product development efforts in an efficient manner. Lynsie Thomason, the Regulatory and Operations Lead at Innovere, shared the company’s journey in identifying a medical device quality management system (QMS) partner that could enhance their team’s knowledge about the industry and accelerate their path to commercialization. More than 30 million patients receive an MRI scan each year in the United States alone. These patients enter a dark, tight, and noisy space for anywhere from 15 to 90 minutes when getting an MRI. For many, this is an isolating and somewhat frightening experience that can lead to significant patient discomfort associated to the MRI experience. Innovere’s Innovision™ device provides patients with visual entertainment and advanced sound quality to increase overall comfort during an MRI by addressing common discomforts, such as, anxiety and boredom. The creation of a device like Innovere’s is not as simple as it seems. MRI technology does not allow the use of other devices that can interfere with the acquisition of successful MRI results. Innovere has built a device that is safe for use in an MRI and does not interfere with the scan or images produced. Innovere recently agreed to a distribution agreement with a large MRI original equipment manufacturer (OEM) to use their InnovisionTM technology with their MRI machines. Early on in their product development efforts, one of the major challenges that Innovere faced came about when Lynsie was conducting market research in her first role at the company. During her research, she realized that Innovere would be responsible for abiding to the quality and regulatory standards of a medical device company. This was unknown to the team at Innovere prior to Lynsie’s discovery. “During this time I stumbled upon the fact that, well... we might be considered a medical device!” she says. 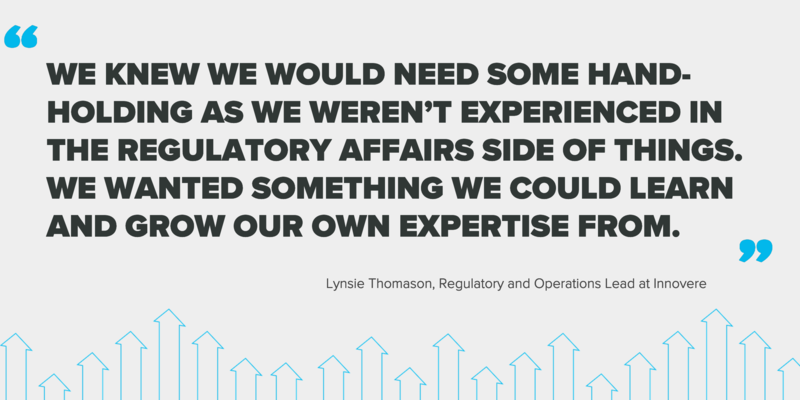 Lynsie soon discovered that being classified as a medical device company meant abiding to standards like ISO 13485, needing to implement a quality management system (QMS), and navigating a changing regulatory climate that the company had no prior experience with. Lynsie and the team at Innovere explored their options for establishing a QMS and also spent time researching the approaches other medical device companies were taking as it relates to quality. Part of the culture at Innovere is to be as digital as possible and to efficiently streamline operations. For them, a fully digital and paperless solution was the only answer. Lynsie assessed a few electronic QMS (eQMS) options before Innovere ultimately decided on Greenlight Guru. What convinced them that they had found the best solution? Lynsie says it was twofold. Greenlight Guru’s software contained everything they needed to meet their eQMS requirements and help navigate the medical device quality and regulatory requirements. It was an easy choice for Lynsie and the rest of the Innovere team as they could now focus on learning the medical device industry with a trusted partner. In addition to Greenlight Guru’s software, the Guru Services were a major selling point for the Innovere team. Partnering with industry experts to educate their team throughout their path to market was a huge advantage that Innovere could not pass up. Without any burdensome configuration or prolonged implementation process, Innovere was taking full advantage of their system in just a few weeks. One of their most valuable experiences since implementing Greenlight Guru was their one-on-one sessions with Customer Success Team Member and Industry Guru, Jesseca Lyons. These advisory sessions equipped their team to take full advantage of the software, while also allowing the team at Innovere to get up to speed quickly on the design control and risk management activities that are critical when commercializing safe and effective medical devices. Lynsie shared that the industry experts on Greenlight’s Guru’s Customer Success team were highly engaged and responsive throughout the implementation process. Since implementation, there have been numerous times where she would like to see a new functionality added to Greenlight Guru and is always pleasantly surprised when she hears that her feedback has been incorporated into frequent software updates. 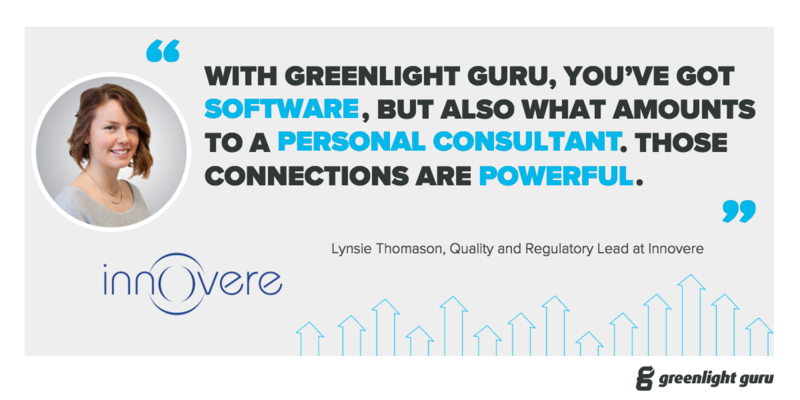 For Lynsie, the true value of implementing Greenlight Guru was apparent during their first audit. The audit was being conducted by the Supplier Quality Department of a potential partner - one of the largest MRI manufacturers - that Innovere was looking to establish an agreement with. Given that this was their first time going through a medical device audit performed by a third party, Lynsie recalls that the team experienced a truly paperless audit and confidently answered questions regarding their QMS thanks to Greenlight Guru. This was largely attributed to built in controls and traceability gained by using Greenlight Guru’s fully connected medical device quality management software. Also, the knowledge attained by leveraging the expertise of Greenlight Guru’s Customer Success Team so they knew what to expect during their audit was huge advantage for Innovere. Ultimately, using Greenlight Guru’s software and expertise allowed them to experience a very successful and seamless audit. Lynsie shared that the prospective partner’s supplier quality team was thoroughly impressed by Innovere’s fully digital QMS that included automatic revision control, audit trails, Part 11 compliant signatures, and system validation. They also had positive remarks about the system’s full traceability between their design controls and risk management matrices. This successful audit ultimately led to a commercial partnership agreement for Innovere. The software is 100% cloud-based. The built-in medical device controls and supporting industry knowledge base is invaluable. Because Greenlight Guru’s eQMS software is 100% cloud-based, Innovere has achieved a truly digital QMS with full traceability. Its ability to simplify validation efforts for Part 11 requirements has enabled the Innovere team to maintain a low total cost of ownership of the system. Between the capabilities of the quality management software platform itself and the industry experts at Greenlight Guru, Lynsie and her team have gained the valuable knowledge necessary for navigating the medical device industry’s complex quality and regulatory environment. Leveraging this partnership with Greenlight Guru has enabled them to grow their own expertise and accelerate the team’s path to commercial success for the first of many devices intended to positively impact patient experiences. Now that they are working with a partner, Lynsie says they’re moving into a scale-up phase where they will transition out of product development and into design transfer. They’re tying up some loose ends with testing as well as submitting their 510(k) and technical file in the coming months. Thanks to Greenlight Guru, the majority of the heavy-lifting is supported by the design control and risk management capabilities of the software. Alongside their new OEM partner and Greenlight Guru, Lynsie and the other team members at Innovere are confident their QMS can support rapidly entering the US, Canadian, and EU markets after receiving 510(k) approval.